Spot on!!! I just retired after my 35-year teaching career and can soooo relate to what you wrote. And yes, we all have those teacher friends who come in before everyone else to have their room looking perfectly by the time everyone else comes to work on theirs....and I, too, would always feel that sense of panic and urgency thinking I'll never get mine done!! 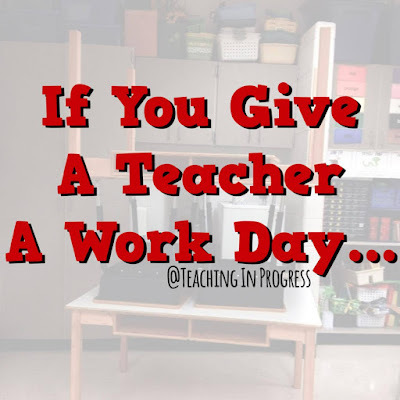 The good thing is, at the end of the week your classroom will have all come together and be that bright, cheery, stimulating room that you want your sweet students to enter and thrive in!! Have me met? Have you watched me in my classroom? So true and funny! Thanks for the laugh amid the chaos! So she'll have to go to school on Saturday and Sunday because the last 2 days before students arrive are PD days where she will listen to people drone on about the faculty handbook and the new procedures for referrals etc. Deborah Bobo-were you in our building today?!?!? SOOOO True! I'm sitting here laughing...I jut love this. Especially the Target bags hidden under the bed. Can I add garage sale books crammed in my trunk, supplies from Walmart.com delivered to school (so my husband doesn't know) and all the random craft supplies stored at my neighbors house? I love that we are all in the same boat. Here's to a great year! I'm not sure. I write from personal experience and my blog posts are filtered through my personal lens. Since I am not a man, I didn't write this piece from, or for, the male perspective. I wrote a piece that shares my feelings of being unfocused and overwhelmed at the beginning of a new school year. I intended to convey the anxiety, not the pronoun. I'm sorry if I offended you or others. My reply was meant in jest. This is all too familiar. You gave me a good laugh, not to mention an urgent desire to rush to my classroom to sort things out. I have been retired for 17 years, and I still occasionally have nightmares about getting my classroom ready! I really enjoyed your post. It reminded me of "If You Give a Mouse a Cookie"! Me, too! I still have back-to-school nightmares after (yep!) 17 years of retirement. Me, too! After 17 years of being retired, I still have back-to-school nightmares! I'm close to retirement and one thing I'm most looking forward to is losing the nightmares. These comments make me sad. I hope the nightmares stop when I retire. I love my work, but I hate the anxiety it brings. 23 year elementary male veteran teacher here. No offense taken. The offended men were surely not elementary teachers. In a world where I am usually the only man in the building or one of the few, getting offended is not worth the time. I am going into my 28th year of teaching and this is still me. I have been up to start on my room for three days and it is still a disaster. I keep rearranging it and can't quite get it right! I read this to my husband to try to get him to understand what is taking me sooooo long. He not only laughed along with me, but said that you described me perfectly. Will we see sequels to this story as the year goes on? I am thinking the "The Days Before a Teacher's Christmas Break", or maybe "Where the Conference Things Are?" So True! As a male teacher speaking, I don't think gender affects us differently. I still go nuts and obsess until every last thing is put in place and perfect for the first day. Then I panic once again realizing I over planned and stressed out for nothing. The beauty is it all works out in the end! Love this! As a male teacher in elementary I go through the same things. I obsess about getting my classroom in perfect order before school starts. On the first day I nervously wait for my students to come in unpack and get comfortable. Then the real panic comes in when I have to plan where all their stuff is going to be put in an already packed out classroom! It all works out in the end beautifully and you would think I would learn, but nope 17 years and counting and still panicking! Lol! Gotta love this crazy but rewarding profession! My wife is a teacher, this doesn't seem to be true... OK it's exactly what happens as a great mom, never enough money and truly gifted teacher starts her year. The pile of stuff grows over the summer when bank account balance and deals match up. (A lot of deals are missed) She makes things special and has a bottomless supply of love for kids. Hah! I just LIVED this blog post on Friday! Another retired teacher here! Oh yes, I remember! And the nightmares of " not being ready". I was so happy when my daughter was old enough to come in and help me cut stuff out to laminate! Sooooo much prep work! I always took two weeks! But, as you say.....all worth it in the end! I used to think, as I closed my door to leave on the Friday before school started...." It will never be this lovely, neat or clean again!" And yes.....every. Single. Year. This sounds so much like me it is almost not funny- but i gave it a big roar and really related to these comments especially! I just love teachers and teaching- this is my 24th year! I still am crazy after all these years! I think the excitment or the nerves gets to me! Or both!! I am so glad that I am not the only one! This was wonderful! I was mentally visualizing myself as I read this. Thank you! Bring on the illustrator! Perhaps royalties earned from publishing such a book could be used to establish a permanent 'back to school' supplies fund. I'm a first year 8th grade math teacher, and am about to experience this. I've seen my classroom and been overwhelmed ever since, since it's my first classroom and it's a portable classroom. But I'm looking forward to setting it up!